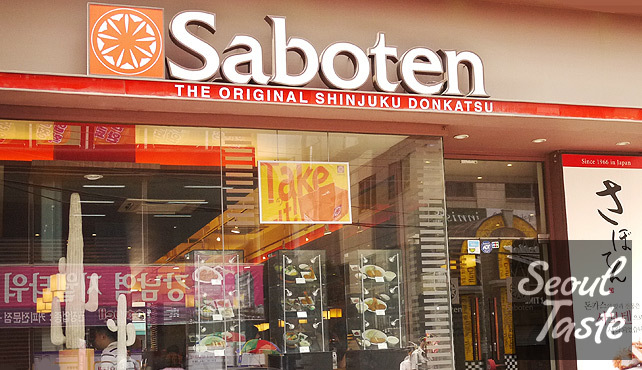 Saboten is a Japanese tonkatsu chain, and as such, they have a duty to preserve the flavor and texture you would expect of authentic Japanese tonkatsu. That said, I have sampled many tonkatsu varieties in Hawaii, and paid close attention to Yelp reviews (oh how I miss Yelp...) by people who were able to make direct comparisons to the real deal. So by now, I have a pretty good idea of what's in store for me when I finally take the trip. And I believe it will be a bit like dining at Saboten. 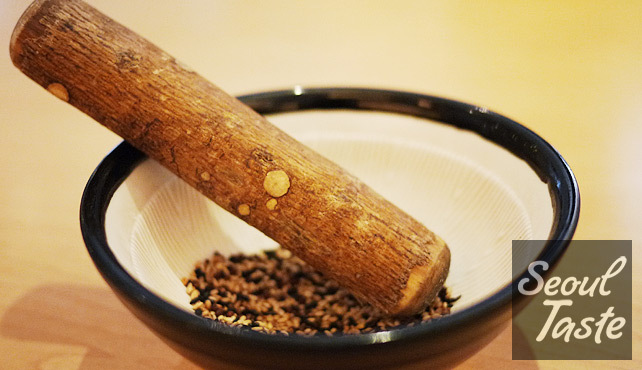 The first bit of authenticity is the DIY sesame seed grinding. For whatever reason, the best katsu joints put you to work while you wait for your food. Once you've ground them to your desired consistency, pour in the katsu sauce, shown on the left. The dressing on the right is for the bottomless cabbage salad that comes with your meal. I often order katsu curry (not only here, but at every place that offers it), but since Abiko is now my go-to place for that, I went with the soba set instead. 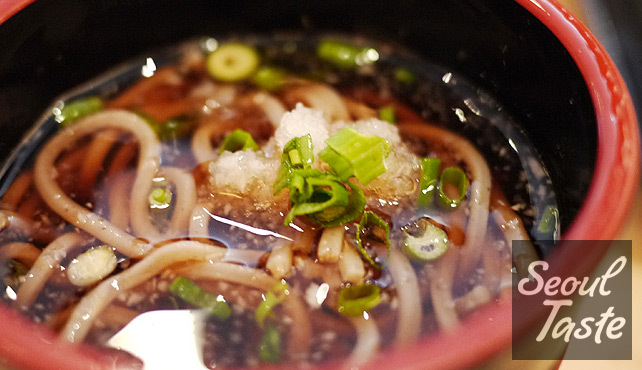 The soba comes with a cold sauce, to which you can add ground daikon (a.k.a. 무, turnip), green onion and wasabi. 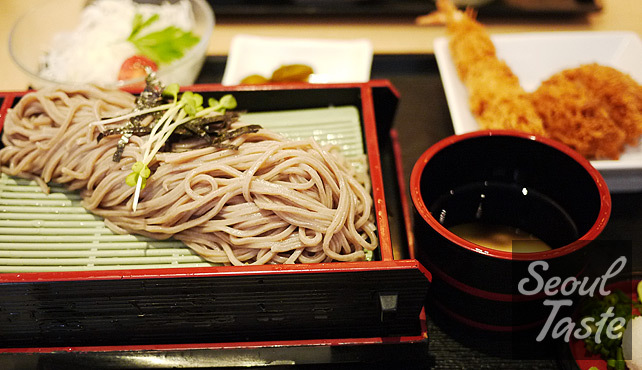 I usually skip the wasabi, not because I don't like it (I do), it's just not the way I'm accustomed to eating soba. You can pour the sauce over the noodles, but I really like the sauce, so I do the opposite and toss the noodles into the sauce bowl. Tastes just like New Year's Eve! 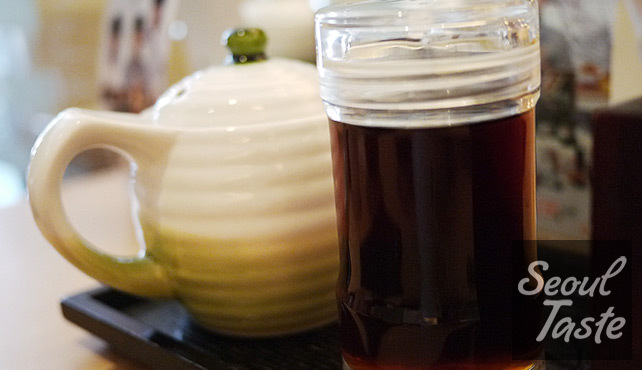 Turns out I am a little bit Japanese after all. 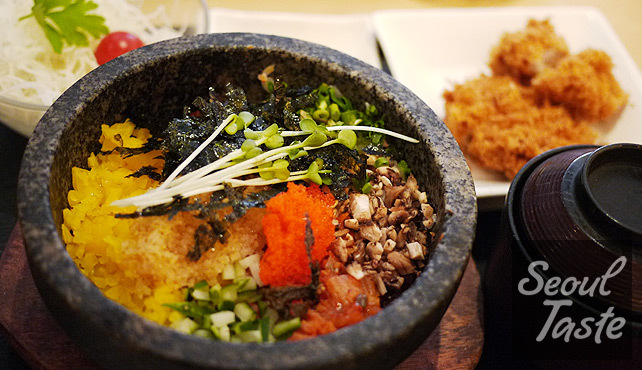 알밥정식 (12000원) - Flying fish roe and rice, served in a hot stone pot, with tonkatsu, miso soup and salad on side. Annie opted for the 알밥 set, which is more of a Korean dish, really. Seems we each indulged our own "native" eating preferences on this trip. The Korean/Korean-ized dishes at Saboten are good, but compared to their equivalents at Korean restaurants, are overpriced for what they are. Naturally, in both sets, the katsu, while seemingly just a side show, is excellent. The bread crumbs used are pleasingly large and irregular. 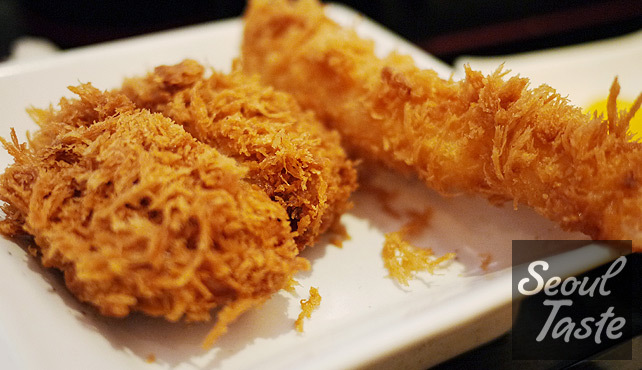 The katsu is crispy and not overly greasy. The only thing I don't like about Saboten is that for me at least, the portions are just too small. Perhaps it is because it is a Japanese restaurant? I don't really subscribe to the whole hara-hachi-bu thing (and that may explain why I am American-sized instead of Japanese-sized) but it wouldn't surprise me if the portions here are intentionally sized to make you only 80% full. In the summer, that is actually okay, since I like to eat patbingsu after lunch, but at other times, it is a little disappointing to walk out of a restaurant in Korea without being full. Service: 4/5 - Not bad, and like the cabbage salad refills, but at times I do wish they had call buttons. Atmosphere: 4/5 - Clean and comfortable.